Size: 11 x 16 inches. Title: 'A Generall Mapp Of The Kingdome Of Tartaria, Designed By Monsieur Sanson, Geographer To The French King, And Rendred Into English By Rick Blome; By His Majesty's Especiall Command'. 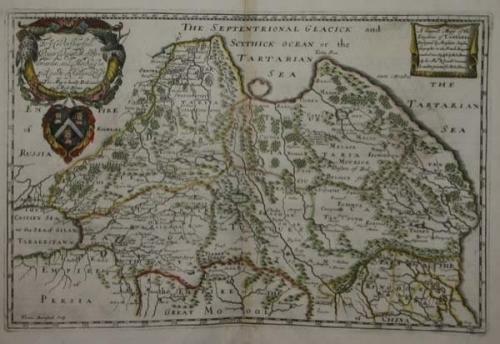 Arctic Ocean labelled ''The Septentrional Glacick and Scythick Ocean or the Tartarian Sea.'' Charts the Great Wall of China and numerous rivers and cities. Dedicated to Roger Vaughan with his coat-of-arms. Early hand-colored in outline and to cartouche (although some coloring there might be later). Lightly toned in center fold, very good condition.